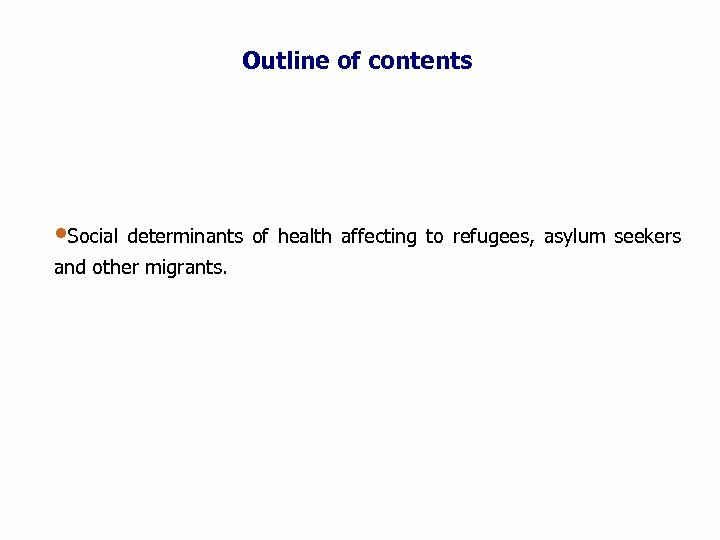 Outline of contents • Social determinants of health affecting to refugees, asylum seekers and other migrants. 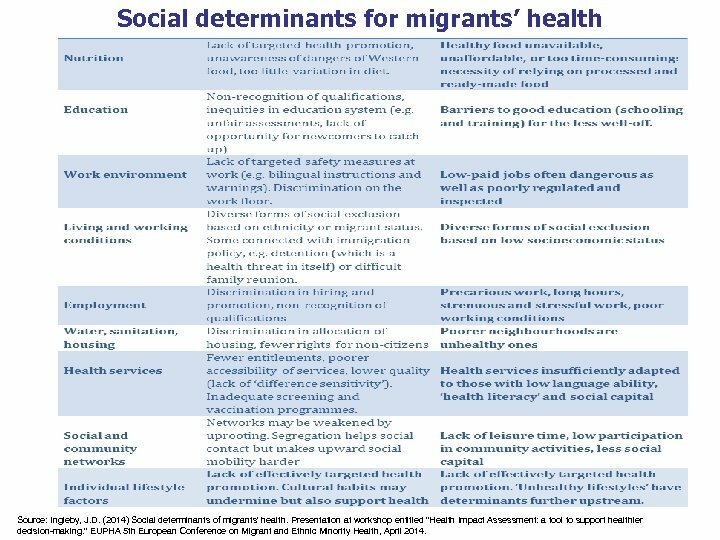 Social determinants for migrants’ health Source: Ingleby, J. D. (2014) Social determinants of migrants' health. Presentation at workshop entitled "Health Impact Assessment: a tool to support healthier decision-making. " EUPHA 5 th European Conference on Migrant and Ethnic Minority Health, April 2014. 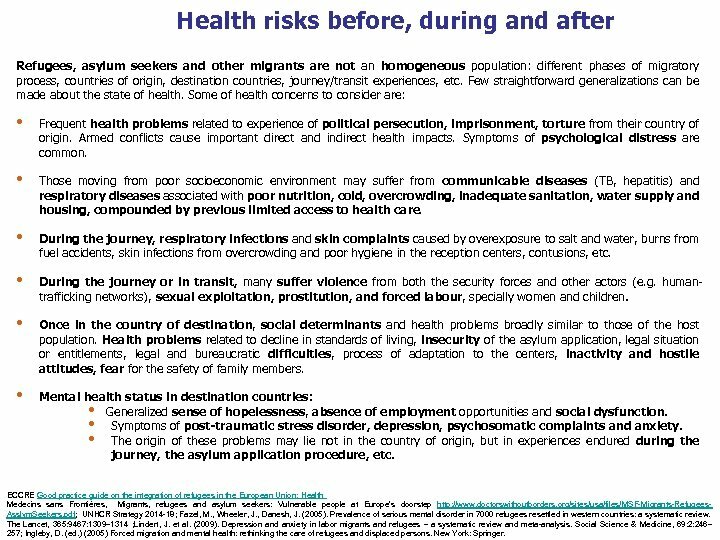 Health risks before, during and after Refugees, asylum seekers and other migrants are not an homogeneous population: different phases of migratory process, countries of origin, destination countries, journey/transit experiences, etc. Few straightforward generalizations can be made about the state of health. Some of health concerns to consider are: • Frequent health problems related to experience of political persecution, imprisonment, torture from their country of origin. Armed conflicts cause important direct and indirect health impacts. Symptoms of psychological distress are common. • Those moving from poor socioeconomic environment may suffer from communicable diseases (TB, hepatitis) and respiratory diseases associated with poor nutrition, cold, overcrowding, inadequate sanitation, water supply and housing, compounded by previous limited access to health care. • During the journey, respiratory infections and skin complaints caused by overexposure to salt and water, burns from fuel accidents, skin infections from overcrowding and poor hygiene in the reception centers, contusions, etc. • During the journey or in transit, many suffer violence from both the security forces and other actors (e. g. humantrafficking networks), sexual exploitation, prostitution, and forced labour, specially women and children. • Once in the country of destination, social determinants and health problems broadly similar to those of the host population. Health problems related to decline in standards of living, insecurity of the asylum application, legal situation or entitlements, legal and bureaucratic difficulties, process of adaptation to the centers, inactivity and hostile attitudes, fear for the safety of family members. • Mental health status in destination countries: • Generalized sense of hopelessness, absence of employment opportunities and social dysfunction. • Symptoms of post-traumatic stress disorder, depression, psychosomatic complaints and anxiety. • The origin of these problems may lie not in the country of origin, but in experiences endured during the journey, the asylum application procedure, etc. ECCRE Good practice guide on the integration of refugees in the European Union: Health Medecins sans Frontières, Migrants, refugees and asylum seekers: Vulnerable people at Europe’s doorstep http: //www. doctorswithoutborders. org/sites/usa/files/MSF-Migrants-Refugees. Asslym. Seekers. pdf; UNHCR Strategy 2014 -18; Fazel, M. , Wheeler, J. , Danesh, J. (2005). Prevalence of serious mental disorder in 7000 refugees resettled in western countries: a systematic review. The Lancet, 365: 9467: 1309– 1314 ; Lindert, J. et al. (2009). Depression and anxiety in labor migrants and refugees – a systematic review and meta-analysis. Social Science & Medicine, 69: 2: 246– 257; Ingleby, D. (ed. ) (2005) Forced migration and mental health: rethinking the care of refugees and displaced persons. New York: Springer. Policy measures tackling social determinants for refugees, asylum seekers and other migrants (structural determinants) Policies are a key factor to improve access to health care and quality of care for refugees, asylum seekers and other migrants: • National and international agreements, improving the rights of “non-citizens”. • Refugees/Migrant integration policies • Improving national and international policies against individual and institutional discrimination, and against social exclusion. • Improving policies of redistribution of power, resources. • Developing national and international policies on education, employment, social protection, housing, environment and health services, asylum and irregular migration. • Inclusive educational policies, attention to linguistic and cultural barriers, underachievement, drop-out and segregation. 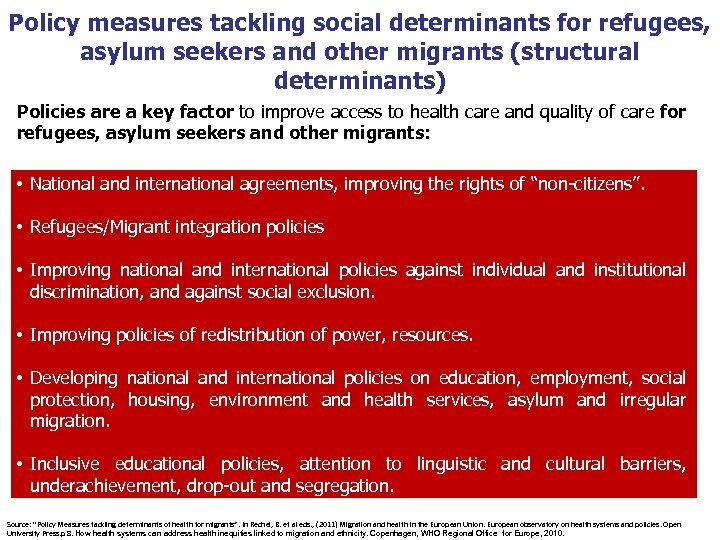 Source: “Policy Measures tackling determinants of health for migrants”. In Rechel, B. et al eds. 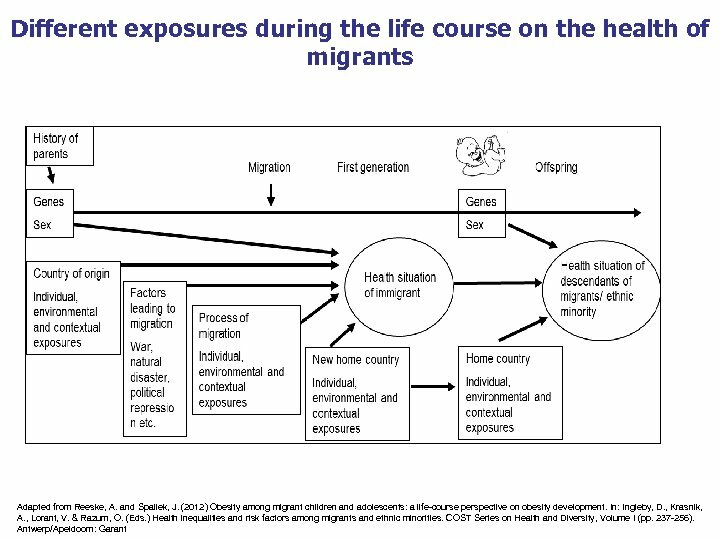 , (2011) Migration and health in the European Union. European observatory on health systems and policies. Open University Press. p 8. How health systems can address health inequities linked to migration and ethnicity. Copenhagen, WHO Regional Office for Europe, 2010. Policy measures tackling social determinants for refugees, asylum seekers and other migrants (intermediate determinants) • Reducing barriers to labor market participation: tackling unemployment; precarious employment; better matching of work to qualifications. Reducing occupational health hazards: better information, inspection, implementation of safety regulations. • Better housing, reduction of environmental hazards, improved transport and other amenities. • Increased availability of healthy food, better targeting of “healthy eating” campaigns. • Empower migrant and ethnic minority communities, mobilizing their health assets and strengthening social networks; combating isolation, loneliness and vulnerability. • Measures to improve knowledge of health risks and the ability to implement it. Strengthening healthy cultural traditions and questioning unhealthy ones. Encouraging avoidance of known risk factors and unhealthy lifestyles. • More appropriate and culturally responsive accessible health services, improved monitoring of health status and service use, more and better research Source: “Policy Measures tackling determinants of health for migrants”. In Rechel, B. et al eds. , (2011) Migration and health in the European Union. European observatory on health systems and policies. Open University Press. p 8. How health systems can address health inequities linked to migration and ethnicity. Copenhagen, WHO Regional Office for Europe, 2010. References • • • Commission of the European Communities. Solidarity in Health: Reducing Health Inequalities in the EU. Communication from the Commission to the European Parliament, the Council, the European Economic and Social Committee and the Committee of the Regions. Commission of the European Communities. Brussels, 20. 10. 2009. Com (2009) 567 Final. Available at: http: //eur-lex. europa. eu/legal-content/EN/TXT/? uri=CELEX: 52009 DC 0567 European observatory on health systems and policies. 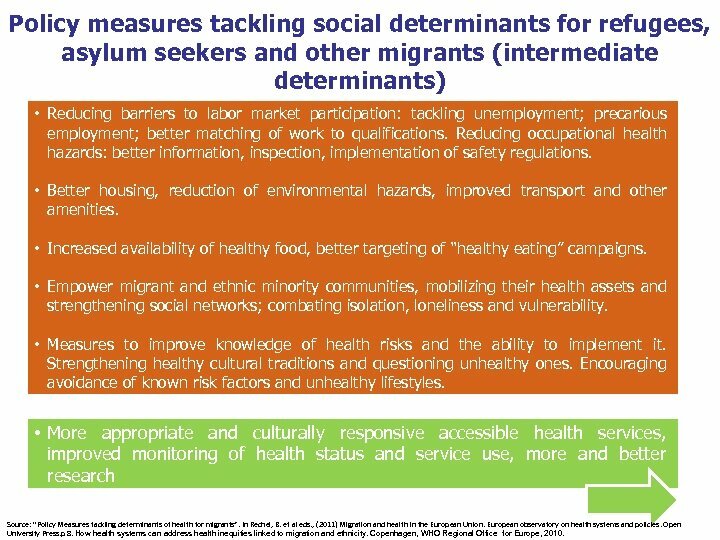 Policy Measures tackling determinants of health for migrants. In Rechel, B. et al eds. , Migration and health in the European Union. European observatory on health systems and policies. Open University Press, 2011. p 8. 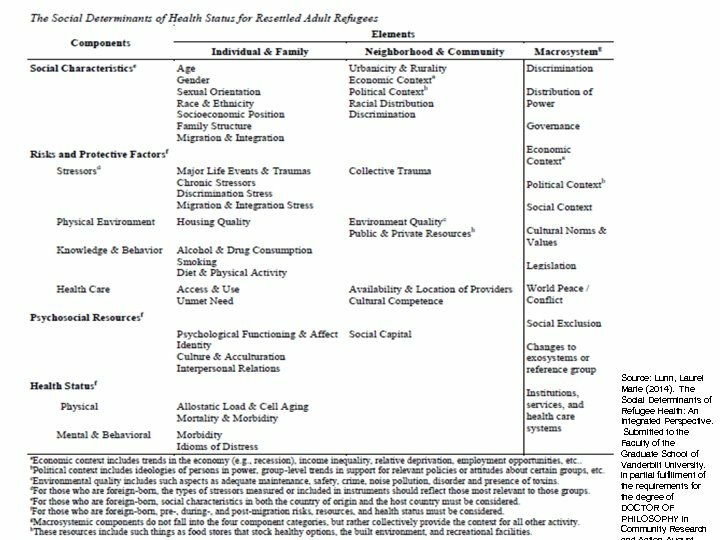 Ingleby D. (2012) Ethnicity, Migration and the ‘Social Determinants of Health’ Agenda. Psychosocial Intervention; 21(3): 331 -341. Available at: http: //www. sciencedirect. 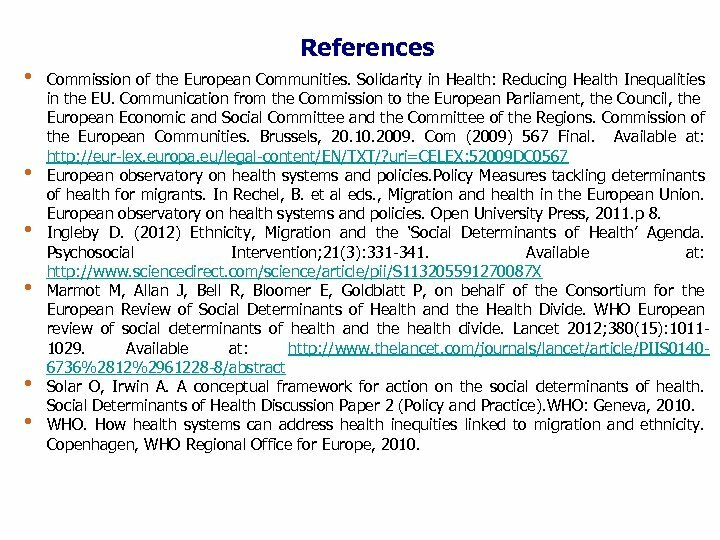 com/science/article/pii/S 113205591270087 X Marmot M, Allan J, Bell R, Bloomer E, Goldblatt P, on behalf of the Consortium for the European Review of Social Determinants of Health and the Health Divide. WHO European review of social determinants of health and the health divide. Lancet 2012; 380(15): 10111029. Available at: http: //www. thelancet. com/journals/lancet/article/PIIS 01406736%2812%2961228 -8/abstract Solar O, Irwin A. A conceptual framework for action on the social determinants of health. Social Determinants of Health Discussion Paper 2 (Policy and Practice). WHO: Geneva, 2010. WHO. How health systems can address health inequities linked to migration and ethnicity. Copenhagen, WHO Regional Office for Europe, 2010. References • • • Bradby H, Humphris R, Newall D, Phillimore J. 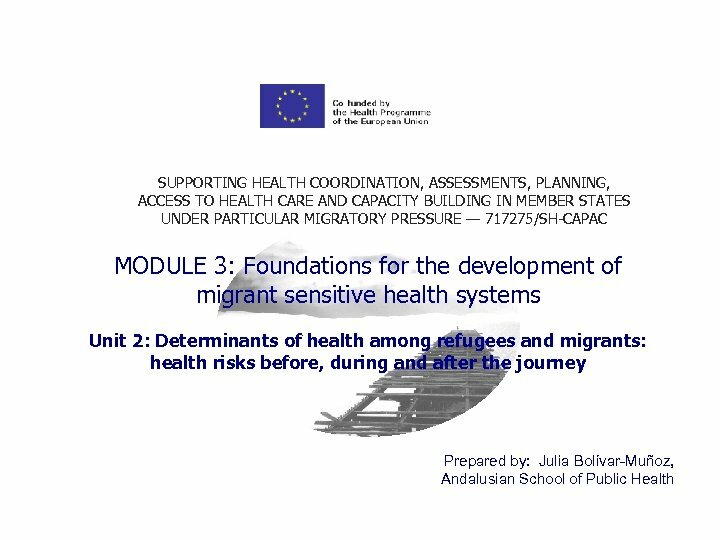 Public health aspects of migrant health: a review of the evidence on health status for refugees and asylum seekers in the European Region. Copenhagen: WHO Regional Office for Europe; 2015 (Health Evidence Network synthesis report 44). 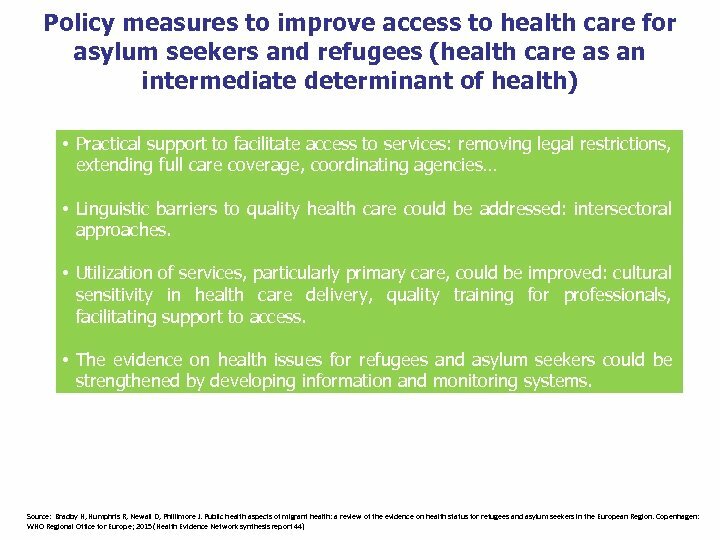 Burnett A, Peel M. Health needs of asylum seekers and refugees. BMJ: British Medical Journal, 2001; 322(7285): 544 -547. 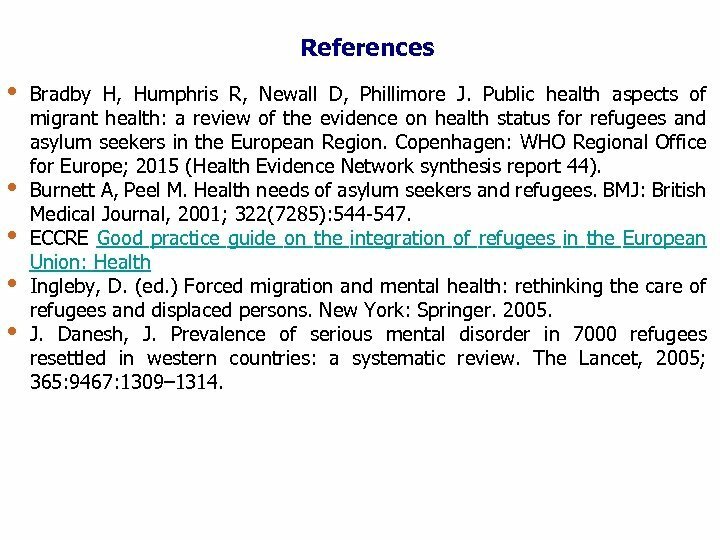 ECCRE Good practice guide on the integration of refugees in the European Union: Health Ingleby, D. (ed. ) Forced migration and mental health: rethinking the care of refugees and displaced persons. New York: Springer. 2005. J. Danesh, J. Prevalence of serious mental disorder in 7000 refugees resettled in western countries: a systematic review. The Lancet, 2005; 365: 9467: 1309– 1314. References • • • Lindert, J. et al. Depression and anxiety in labor migrants and refugees – a systematic review and meta-analysis. Social Science & Medicine, 2009; 69: 2: 246– 257. Lunn, Laurel Marie (2014). 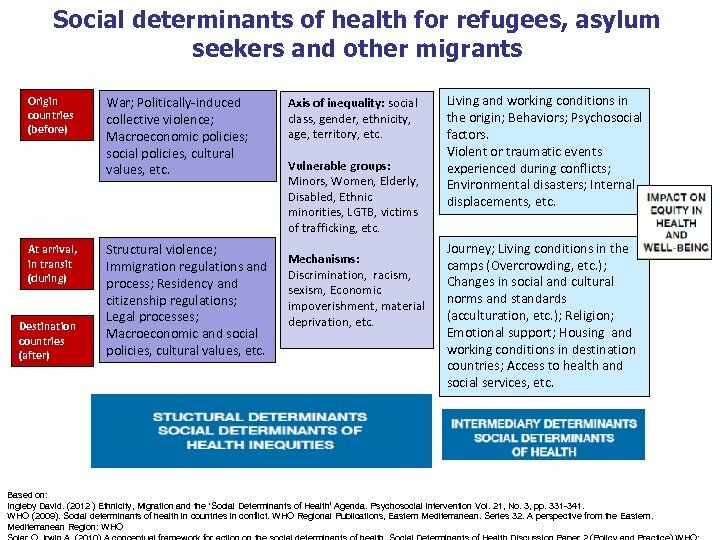 The Social Determinants of Refugee Health: An Integrated Perspective. Submitted to the Faculty of the Graduate School of Vanderbilt University. in partial fulfillment of the requirements for the degree of DOCTOR OF PHILOSOPHY in Community Research and Action August, 2014. Nashville, Tennessee Medecins sans Frontières, Migrants, refugees and asylum seekers: Vulnerable people at Europe’s doorstep http: //www. doctorswithoutborders. org/sites/usa/files/MSFMigrants-Refugees-Asslym. Seekers. 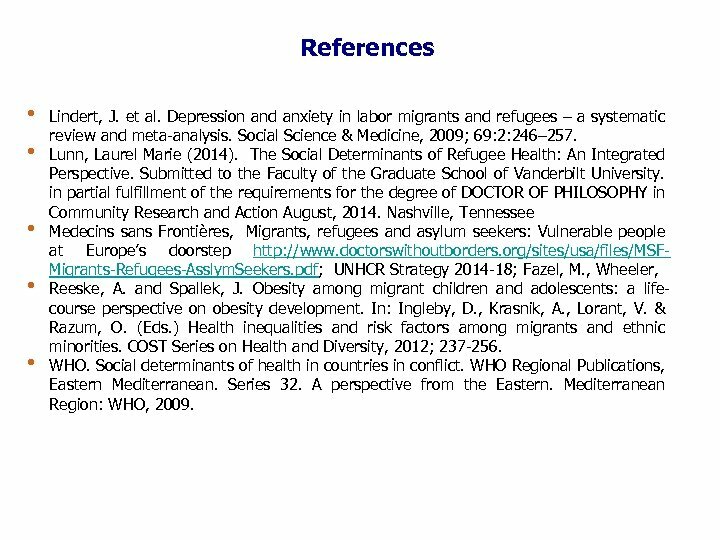 pdf; UNHCR Strategy 2014 -18; Fazel, M. , Wheeler, Reeske, A. and Spallek, J. Obesity among migrant children and adolescents: a lifecourse perspective on obesity development. In: Ingleby, D. , Krasnik, A. , Lorant, V. & Razum, O. (Eds. ) Health inequalities and risk factors among migrants and ethnic minorities. COST Series on Health and Diversity, 2012; 237 -256. WHO. 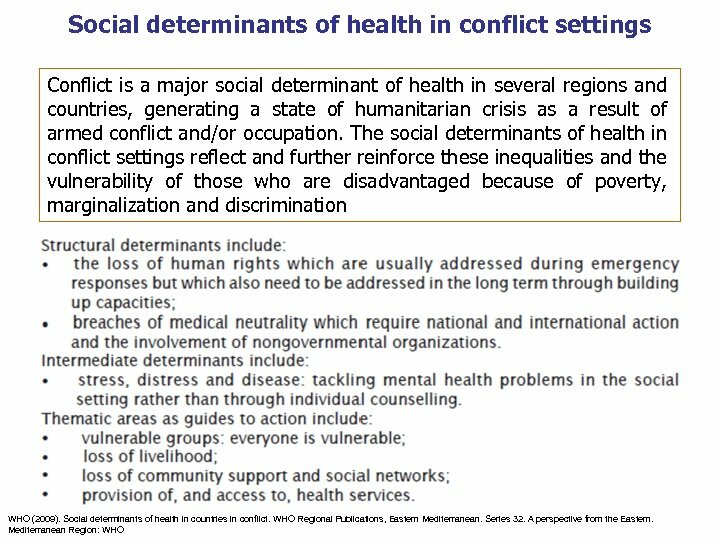 Social determinants of health in countries in conflict. WHO Regional Publications, Eastern Mediterranean. Series 32. A perspective from the Eastern. Mediterranean Region: WHO, 2009. © – 2016 – Escuela Andaluza de Salud Pública. All rights reserved. Licensed to the Consumers, Health, Agriculture and Food Executive Agency (CHAFEA) under conditions. This document is part of the project ‘ 717275 / SH-CAPAC’ which has received funding from the European Union’s Health Programme (2014 -2020). The content of this report represents the views of the author only and is his/her sole responsibility; it cannot be considered to reflect the views of the European Commission and/or the Consumers, Health, Agriculture and Food Executive Agency or any other body of the European Union. The European Commission and the Agency do not accept any responsibility for use that may be made of the information it contains. 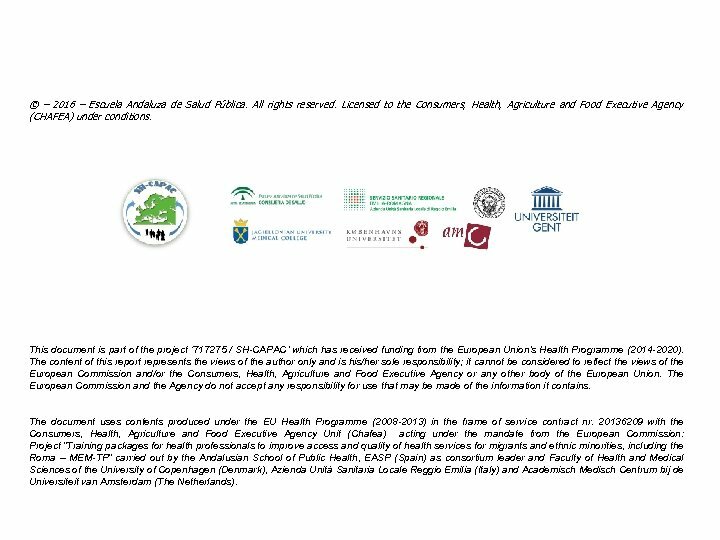 The document uses contents produced under the EU Health Programme (2008 -2013) in the frame of service contract nr. 20136209 with the Consumers, Health, Agriculture and Food Executive Agency Unit (Chafea) acting under the mandate from the European Commission: Project “Training packages for health professionals to improve access and quality of health services for migrants and ethnic minorities, including the Roma – MEM-TP” carried out by the Andalusian School of Public Health, EASP (Spain) as consortium leader and Faculty of Health and Medical Sciences of the University of Copenhagen (Denmark), Azienda Unità Sanitaria Locale Reggio Emilia (Italy) and Academisch Medisch Centrum bij de Universiteit van Amsterdam (The Netherlands).